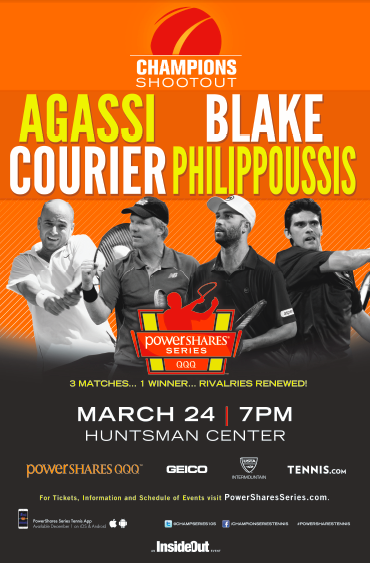 Salt Lake City, UT – Andre Agassi, Jim Courier, James Blake and Mark Philippoussis are set to compete on the University of Utah campus as part of the PowerShares Series tour on March 24 at 7pm at the newly renovated Jon M. Huntsman Center. The 2015 PowerShares Series is a competitive tennis circuit featuring legendary tennis icons and several world renowned champions. The 12-city tour of one-night tournaments features 4 Champions paired off in one set semi-finals and culminates with the winners meeting in a one-set championship match. Tickets are on sale at http://www.powersharesseries.com. Use promo code UUTAH to get a 10% discount on P2-P5 tickets. Andre Agassi is a former No. 1 player in the world and considered to be one of the greatest tennis players of all time. He’s won a total of 8 Grand Slam titles and is one of four male players to achieve the Career Grand Slam, having won Wimbledon (1992), the US Open (1994, 1999), the Australian Open (1995, 2000, 2001, 2003) and the French Open (1999). He is the 1996 Olympic Gold Medal Champion, has won the 1990 ATP Tour World Championships and was part of three Davis Cup winning teams (1990, 1992 & 1995). Jim Courier is also a former No. 1 player in the world and is currently team USA’s Davis Cup Captain. Courier has won four Grand Slam titles, the French Open (1991 & 1992) and the Australian Open (1992 & 1993) and holds the record for being the youngest man to have reached the finals of all four Grand Slam singles tournaments, at the age of 22 years and 11 months. He also won five Masters 1000 series titles. 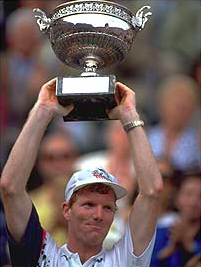 As of 2014, Courier is the last man to win the Australian Open and French Open back-to-back, in 1992. Philippoussis is a former Australian professional tennis player who reached as high as No. 8 on the ATP World Tour Rankings. 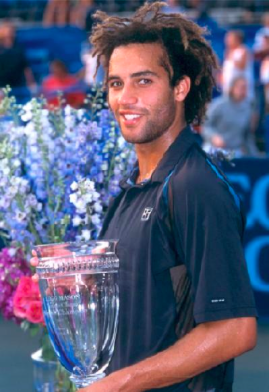 He’s won a total of 11 ATP Tour titles and reached the 1998 US Open final, losing to Pat Rafter, and the 2003 Wimbledon final, losing to Roger Federer. 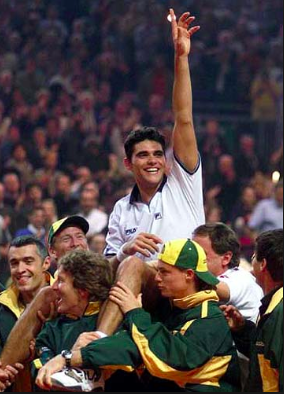 He was part of Australia’s Davis Cup winning team in 1999. James Blake ranked as high as No. 4 in the world and amassed 10 ATP Tour titles. He reached the quarterfinals of the Australian Open (2008) and the US Open (2005 & 2006) and reached the semifinals of the Beijing Olympics. His career highlights include reaching the finals of the ATP Masters Cup (2006) and winning the Davis Cup in 2007.